It was worth the wait, the delays, to see how beautifully Chef Jamie Luna transformed a long empty restaurant in the heart of Pikesville. Mari Luna (ML) Latin Grille, (don’t confuse this with his Mari Luna (ML)Mexican Grille, a mile south on Reisterstown Road across from Seven Mile Lane), is decorated with vivid colors, tasteful banquettes, and for the foodies - a large picture window where you can watch the kitchen staff at work -watch the short video. I was not a fan of Mexican food when ML Mexican Grille opened five years ago but then learned the joys of Mexican food through Chef Luna. His path wasn’t an easy one, working his way from dishwasher to prep cook, from prep cook up to the sous chef position at Michel Richard’s Citronelle and as the executive chef at Steve De Castro’s Babalu Grill. Over the years at ML Mexican Grille, Chef Luna would introduce specials highlighting his great skills with seafood and Latin cuisine. But alas, the ML Mexican Grille is a small venue with limits but it didn’t stop its huge following putting them at the top of the Baltimore’s Zagat list. Friday night, the husband and I journeyed to ML Latin Grille and were surprised that even before 6 p.m. there were a number of tables filled. 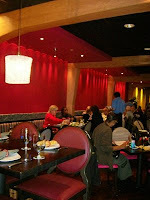 If restaurateurs are hunting for staff and can’t find them it is because they are all at ML Latin. The staff wants to please, though at times, I found them a bit intrusive – no harm meant they just want to make sure all is good. I am keeping in mind that they have only been open a week and refining their service and working from a new kitchen. Chef Luna has a huge fan base and by 7:00 p.m. the restaurant was packed with guests waiting. They do accept reservations at ML Latin which is something that they don’t do at ML Mexican and from the crowd; I highly recommend making a reservation. Out of curiosity, after dinner the husband and I rode by ML Mexican to see what was going on there, it was packed with people in line. I’ve been noticing the lack of bread (or similar starter items) at restaurants lately. At Three and at a restaurant in Fells Point (who I won’t name but had a pretty disappointing meal) there was no bread offered and it was the same at Bicycle. Could it be there way of cutting costs? 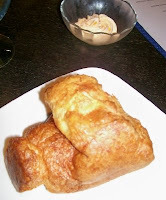 With that said, at ML Latin we were presented with large, fresh popover rolls with a mango citrus butter that is too die for – airy, puffy, warm rolls. Out of the three soups offered on the menu we chose the Lobster Bisque (7) and Honduran Conch Chowder with coconut milk (6.5). 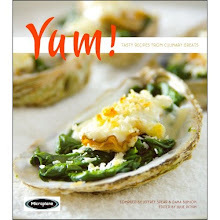 The conch was tender, not an easy feat and the coconut milk added a nice subtle richness. In looking at the menu, I recognized many of the dishes that were specials at ML Mexican. I counted 17 entrees ranging in price from thirteen dollars (Peruvian Chicken) to twenty-six dollars (Seared Chilean Sea Bass or Roasted Rack of Lamb). You choose 2 sides from the selection of Tostones, Frijoles Negros, Garlic Mashed Potatoes, Yuca Fries, White Rice, Plantains, Congri (black beans, rice and bacon) or the evening’s vegetable medley sauté. 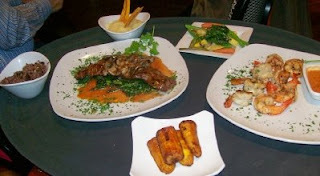 The husband chose the Bistec a la Criolla (17) mesquite grilled skirt steak sautéed with Spanish mushrooms and red wine sauce with garlic mashed potatoes and the congri and I ordered the Camerones con Cana (19) pan seared sugar skewered jumbo shrimp with mojito sauce and I chose the sautéed veggies and the plantains. From the description, I assumed that the shrimp would be skewered possibly on sugarcane but they hadn’t been skewered at all that I could see…though they were perfectly cooked. The Chocolate Tres Leche (6) called out to the husband and I indulged in the Tropical Breeze (6), house-made mango and coconut ice cream combo. 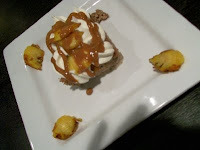 The tres leche was decadently rich with a lick-your-lips caramel sauce and the semifreddo like Tropical Breeze was accompanied with fresh fruit proved to be a nice finish to a very tasty meal. With so many new and interesting Latino dishes to taste I know that I will be back again and again as well as getting our favorite Mexican dishes at ML Mexican Grille.